Traditional overhead doors are limited in application. With outside-the-box technology, the door becomes a complement to architectural design vs. a conflict. The door becomes more than just a door. 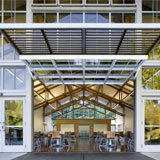 Gain insight into various types and applications of customizable overhead doors. Learn about important safety features and standards and how these doors can contribute to a sustainable project, including LEED certification.